And Jesus says: "I cannot heal you my son...you have a pre-existing condition." That's just one of many hilarious scenes in Michael Moore's latest offering -- CAPITALISM: A LOVE STORY. Although most reviewers refer to Moore's films as documentaries, they are clearly more one man's one-sided point of view regarding serious issues in contemporary America. If you have ever spent a couple of hours (or more) listening to folks like Limbaugh, Hannity or Beck, Needtovent strongly recommends you give Michael Moore 120 minutes of your time as well. We are confident that you will walk away from the theater entertained, enlightened and, most likely, infuriated as Hell. "Dead Peasant Insurance" -- life insurance policies taken out by Fortune 500 companies on executives, and, in the case of Wal-Mart, lowly "associates" as well. Should the insured die, the beneficiary is the company, not the deceased's family. In these cases, the company actually profits when their employees die, the sooner the better, thus collecting up to $5 million in hard, cold cash as one of the cases explored up-close and personal revealed. While the origin of the name "Dead Peasant Insurance" remains unknown, it certainly serves as a metaphor for the prevailing attitude of callous corporate America. 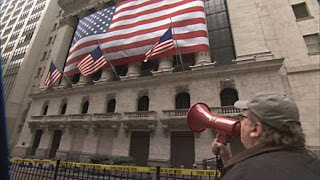 Another topic explored is the risky, reckless, rapacious Wall Street gamble known as "derivatives." These "spin-off" investment instruments are so complex not one of the three financial experts, including the Department Chairman of Harvard's Finance School, can explain them. In fact, some are apparently so complicated that they are created by computers and not even the software authors fully understand them. The bottom line: if there is a default on a mortgage, the investor wins -- big. And if there isn't a default, the investor can still hedge his bet by also betting the derivative will fail. (How convenient.) It's a win-win for the investment firm -- and a toxic, egregious lose-lose for the average American family. The horribly low pay for airline pilots -- we are shown a "Give a penny to a pilot" jar at the boarding gate of an airliner to underscore the severity of the problem (first-year pilots often earn less than the assistant manager at Burger King). The widening gap between the richest and the rest of America -- the richest 1% of the population has as much accumulated wealth as 95% of the poorest. Citibank has even declared in private memos that America is now a plutonomy. It sure seems like we need more Howard Beales and fewer Walter Mittys among 95-99% of our population. The foreclosure epidemic -- one family in particular is profiled as they are unceremoniously kicked off their farm that has been in the family for over four generations. But perhaps the most revealing sequence is the fascinating, dynamic archival footage of President Franklin Delano Roosevelt appearing on camera advocating a Second Bill of Rights. According to our sources, this Movietone News footage, shot at the explicit invitation of an ailing FDR at the end of his last State of the Union address, has never been seen previously -- for some reason it wasn't included in the newsreels of the day. Of course, with Roosevelt's death this Second Bill of Rights was never enacted here, in the United States, although many of its provisions are now in the constitutions of Germany, Italy and Japan -- which were all authored with considerable American input and involvement after WWII ended. Love him. Hate him. But don't ignore him. 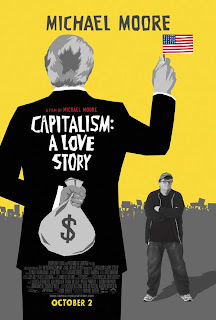 CAPITALISM: A LOVE STORY is definitely worth seeing. Roger Ebert said it best, at the very least you'll come away realizing that with corporate greed and Wall Street shenanigans the order of the day, capitalism means never having to say you're sorry. Please go see CAPITALISM: A LOVE STORY. We predict you'll leave mad as Hell...and that's a good thing.